Catalog Favorites is an online store that combines the best selling items from several different catalogs owned by Potpourri Group Inc, a privately held company which is lead by Jonathan Fleischmann as President and CEO. In total there are 15 different brands on offer. 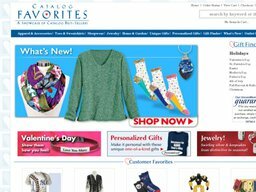 The online store can found at CatalogFavorites.com, though they still operate a traditional mail order catalog with orders over the phone at 1-800-221-1133. Catalog Favorites was founded in 1998 and the website was launched in 1999. Over the years it has served as both a clearance house for discontinued items from the main catalogs, and a one stop destination for all of Potpourri's best sellers. Why pay full price when you can get discounts or special offers? Coupofy does the leg work and collects all the latest Catalog Favorites coupon codes so you can make great savings on every order. The Catalog Favorites website is very user friendly, allowing you to browse products in well organized categories or via a search bar at the top of the page. If you already have one of the catalogs you can speed up the ordering process by entering the item number. Personalizations usually simply involve adding a name or short message to an existing product, such as a t-shirt, sign, or piece of Jewelry. You can also buy gift cards between $25 and $100 so the recipient can make their own purchases. There is also a page of "outlet" or clearance items. For further savings browse our list of Catalog Favorites coupons and when you see an offer you like, click on it to be taken directly to the site where you can apply the code before payment. CatalogFavorites.com also allows you to request a free print catalog if you prefer to order the old-fashioned way. CatalogFavorites.com supports all major credit cards for payment, including American Express, MasterCard, Visa, and Discover. You can also use their own gift cards for all or part of your order. The store caters to both American, Canadian and international customers, however shipping can be quite expensive unless you're making a big order. In the US standard delivery can take up to 7 days and is priced depending on the value of your order. Anything below $10 is $4.99 to ship. Once the value reaches $200 it's a flat rate of $19.99. These same charges apply to international customers, however they are also subject to an extra $75 surcharge per order. In Canada the surcharge is $35. There are also several other more expensive options for faster shipping. From time to time you can use Catalog Favorites coupons to claim free standard shipping. Obviously if you have used a Catalog Favorites promo code you will only be refunded the actual amount your card was charged.